For many fisherman, gloves are an essential piece of equipment. When cleaning fish, you want to ensure you filet the fish, not your fingers. And if you’re more of a catch and release guy, gloves will allow you to grip the fish without squeezing the fish (and damaging vital organs). Wetting the gloves will also ensure you don’t remove the fish’s protective slime layer while handling. Are you convinced that gloves might deserve a place in your tackle box? If so then read our reviews of the three top brands for sale. The Rapala Marine Fisherman Glove is a nice glove that is also affordable. These great basic gloves can be purchased for a cheap price and they provide a good non-slip grip on your catch. The durable latex coating will protect your hands from dorsal fins, teeth and gill plates. However it’s not to be used as a fillet glove. These gloves are low maintenance, just machine wash and drip dry for years of use. They are available in large and extra large. We consider these gloves to be good for fish handling. Filleting fish is a few notches up in complexity, and the Lindy Fish Handling Glove is more than up for the challenge. This glove is advertised as a “bullet-proof vest for your hand” and is most definitely made for filleting fish. This amazing glove boasts 800 percent more puncture protection than similar gloves. The glove is a bit more pricey, but that price pales in comparison to a trip to the emergency room. And when you think about the hazards inherent with fishing: fishing hooks, needle-sharp fins and teeth- not injuring your bare hands would be a blessing. Mix in a sharp knife with your slippery catch, and you’ll be begging for a pair of gloves like these. The glove is available for both the left or right hand. The Lindy is easy to locate in your tackle with high-visibility orange fabric and is available in three sizes- small/medium, large/extra large and double extra large. 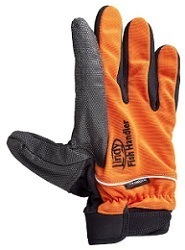 The Lindy Fish Handling Glove has another advantage over its competitors- SuperFabric. This revolutionary fabric has been adapted for use in industrial, safety and military applications, so it will certainly withstand a slippery fish and your fillet knife. The fabric is enhanced with a configuration of tiny armor plates that provide resistance to piercing objects. From fishing hooks to barbs to sharp teeth and fins, this glove will ensure your hands remain unscathed while handling your catch. The fabric is also extremely flexible, even when used in multiple layers. We challenge you to find a more materially sound product on the market. 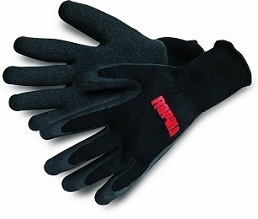 This glove also resists odors and is machine washable for easy clean up. A Velcro wrist strap allows you to adjust the fit for maximum comfort and grip. The Fish Handling Glove is chemical resistant, repels gas and oil and it works great in both freshwater and saltwater. From efficient handling to quick release, this glove will win over sportsmen and conservationists alike. These are the best fishing gloves for the money. The Glacier Glove Alaska River Flip-Mitt Fishing Glove is another option for anglers. 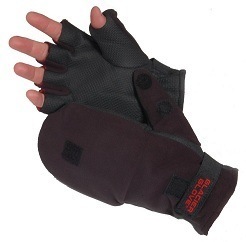 This glove comes in four sizes- small, medium, large, and extra large and may be purchased for a reasonable price. As you might expect, the Glacier Glove Alaska River series was designed for the harsh conditions expected in Alaska. The glove is windproof with a flip-mitt design to keep those digits toasty on a long excursion. The fleece-lined neoprene palm ensures both comfort and grip on your frozen catch. This glove might just provide the perfect combination of dexterity and warmth for your bone-chilling trips. Whether you are relocating trout with the Rapala Marine Fisherman Glove, recreating “The Deadliest Catch” with the Glacier Glove Alaska River Flip-Mitt Fishing Glove or demonstrating your filleting prowess for the neighborhood fish fry with the Lindy Fish-Handling Glove, we’re confident that one of these products will satisfy your needs. Fishingtipsdepot.com is a participant in the Amazon Services LLC Associates Program, an affiliate advertising program designed to provide a means for sites to earn advertising fees by advertising and linking to Amazon.